As I write, the sunlight is sparking on frosty ground and more snow is forecast in the next few days. It seems a Narnian winter, although we have had Christmas. And yet, all around, there are signs that spring is trying to push its way through. The most valiant of these are the snowdrops. Defying the weather’s wintry rages, they cluster in ever growing numbers at the edges of flowerbeds and under trees. 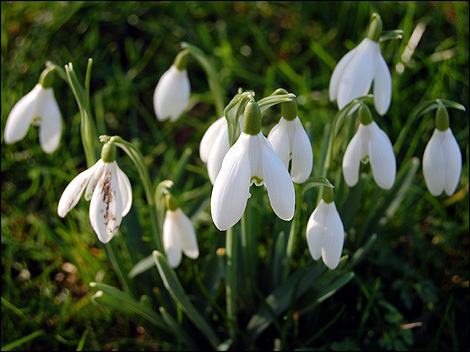 Jon Silkin’s poem paints the snowdrop’s angular fragility with sharp attention to detail. Away where that part finishes. In the vast canvas of Leo Tolstoy’s novel, Anna Karenina, the background of the Russian landscape is seen most often in relation to Levin, one of the central characters. Levin’s closeness to the land is part of his belief that he has a duty to farm his huge estate responsibly: the livelihoods of all the people living on his land depend on this. Bruised and broken-hearted by Kitty’s rejection, he returns to his estate, determined to throw himself into his work. There is more than a touch of symbolism in Tolstoy’s description of spring. We are told our spring will arrive late this year: so does Tolstoy’s, bringing with it, almost overnight, fresh life, fresh warmth, fresh hope. If you have any favourite pieces of writing which celebrate the coming of spring, please let me know or – better still – send a comment to this site. My next email and blog post will be in two weeks’ time. Until then, may your mornings be sunny and frost free.